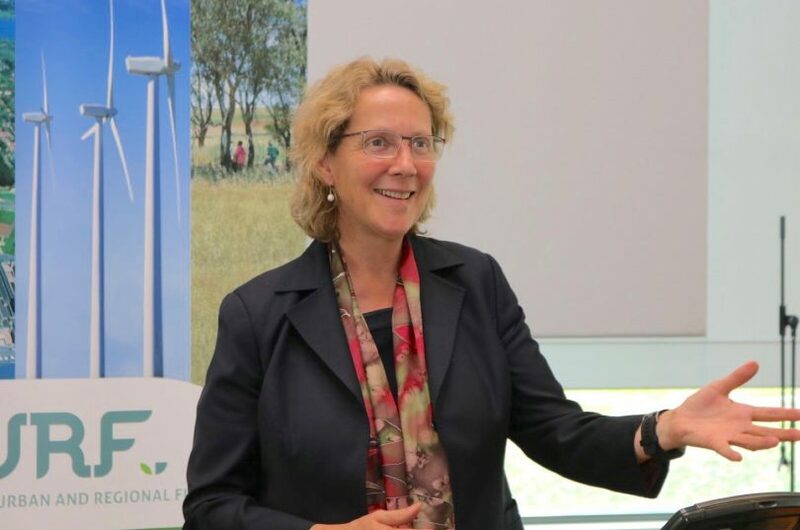 Professor Barbara Norman utilised cutting-edge sustainability science to inform land use planning at the urban and regional scale. Photo: University of Canberra. University of Canberra academic Barbara Norman has been honoured at the 2018 ACT Awards for Planning Excellence for her recent book examining how planning can help prepare urban and regional communities for the significant changes now occurring in 21st-century cities. Professor Norman, who is Foundation Chair of Urban and Regional Planning and Director of Canberra Urban and Regional Futures (CURF) at UC, received the Cutting Edge Research and Teaching award at a Planning Institute of Australia (ACT) event on Friday (26 October) evening. Judges commended Professor Norman’s research for the book, which draws on case studies from four cities selected for their publicly stated commitment to sustainability – Canberra, Kuala Lumpur, Copenhagen and New York. “Professor Norman has utilised cutting-edge sustainability science to inform land use planning at the urban and regional scale [in a book] that will undoubtedly appeal to a broad range of audiences,” they said. The Heart Foundation and the ACT Government’s Environment, Planning and Sustainable Development Directorate (EPSDD) took out the Improving Planning Processes and Practice Award for their Active Living Program and for incorporating active living principles into the Territory Plan. The genesis of this initiative was a 2014 gap analysis of the Territory Plan to identify opportunities for changes that would encourage physical activity. The analysis led to the development and implementation of the Active Living Variation to the Territory Plan. To accompany the changes, the Heart Foundation and EPSDD worked together to build capacity, awareness and understanding of the variation through a social media campaign, educational activities and community advocacy. The judges were impressed by the holistic approach taken by the Heart Foundation and EPSDD to deliver the Active Living Variation. “By embedding health considerations into the Territory Plan, the Active Living Variation promotes development that supports active lifestyles, encourages incidental physical activity and ultimately contributing to a reduction in cardiovascular and other lifestyle-related diseases,” they said. EPSDD also won the Public Engagement and Community Planning Award for its ACT Housing Choices project supporting a compact and more livable and sustainable city. Another ACT Government initiative, the Gungahlin Place light rail platform and precinct, received a commendation in the Plan to Place award. “This a fine example of the delivery of a plan into a successful place,” the judges said. “The light rail platform will enhance the public transport accessibility of the Gungahlin centre and has the capacity to improve the vibrancy of the town centre [and] the ability to be replicated when the light rail network expands,” they said. The Best Planning Ideas – Large Project award was won by The Rental Affordability Index, a joint project between National Shelter and Community Sector Banking, and SGS Economics and Planning. The Rental Affordability Index is an easy to understand indicator of rental affordability relative to household incomes across Australia, with applications for better illuminating the housing needs of vulnerable community groups and individuals. The judges commended the use of public availability, interactive maps and multiple options to gain a picture of rental affordability based on income, dwelling size and geographic location. “It is hoped [the Index] will be widely utilised to support evidence-based planning on rental affordability issues,” the judges said. PIA ACT President Karen Wright congratulated the winners and all the finalists, saying their work was contributing materially to the creation of more sustainable and prosperous communities in the ACT.